Size of Baby: If he's staying on the half a pound a week weight gain track, Campbell should weigh 4.5 pounds and be around 19 inches long, about the size of a honeydew. How I'm Feeling: I got sick something awful while I was in Little Rock last weekend and again yesterday but what's new. I don't think I've gone more than 10 days this entire pregnancy without throwing up. I've been a little tired and have had a couple of "holy moly that hurts" moments (I swear he's tried to come out a few times) but all in all I still feel really great and pretty much like my normal self. Cravings/Appetite: For the first time this entire pregnancy, I've actually been craving healthy foods. I think this has more to do with the warm weather (anyone else tend to eat healthier when it's warmer out?) than anything else but it's been nice. Clothes: I've been wearing Piko tops almost every day lately. I like how loose they are on my tummy. My belly is so big these days and I feel more comfortable wearing tops that are really flowy instead of more form fitting. While I'm lounging around my house I always wear my favorite sweat pants and maternity tank tops from Old Navy that I love but are SO tight. Scott is the only person that will ever see me in those tight tank tops! Movement: Campbell is still moving a lot even though I can tell the poor little guy is running out of room. He pretty much kicks me in the same two spots now and that's it. 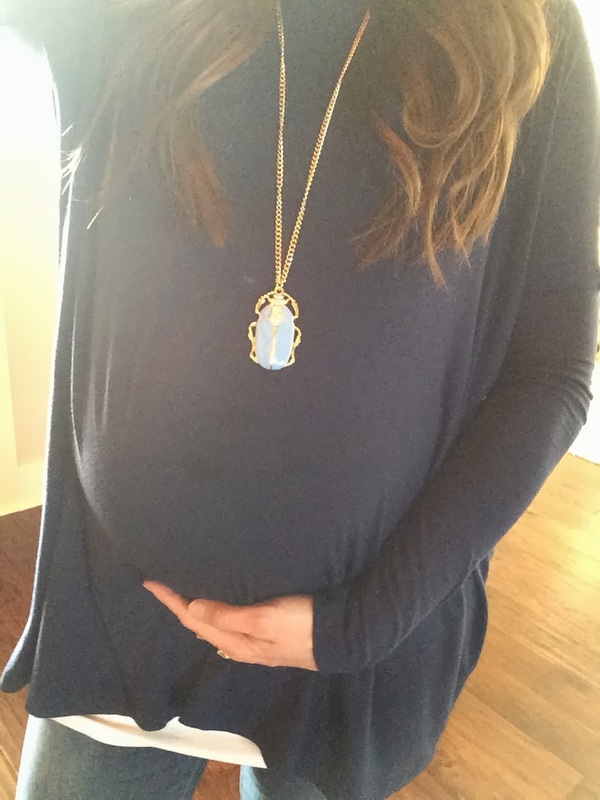 Changes in Me: My belly button is shutting down! I don't think it's going to poke out, just close up and become non-existent. I'm also starting to get that line that runs up to my belly button. I actually noticed it when I was like, 5 weeks pregnant but it was so faint that nobody else could see it. It's not much darker and if I use a tan towel (you know how much I love a tan) it goes away but it's definitely more visible these days. Baby Purchases: I found two little items at the Gap that I couldn't resist and wasn't patient enough to wait until they go on sale (I've learned Gap almost instantly puts their new clothes on sale) before I got them. Their spring clothes are finally starting to hit the shelves and it's making me way excited! Campbell has tons of fall/winter clothes that I got on sale but not many spring/summer clothes at all. Any time I find something that he can wear right away, I think it's so fun! Favorite Moment This Week: Getting my maternity photos back! I want to blow one up and put it in my bedroom but I can't decide which one I want to do because so many turned out looking so great! The photographer is very talented!! 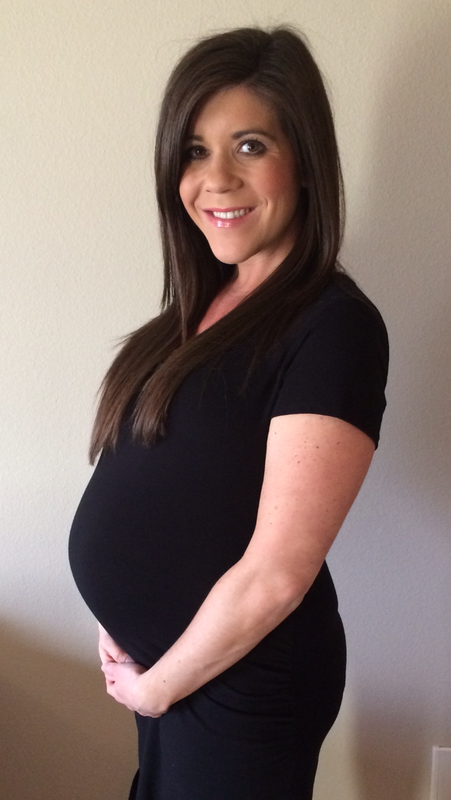 Looking Forward To: My baby shower tomorrow night! 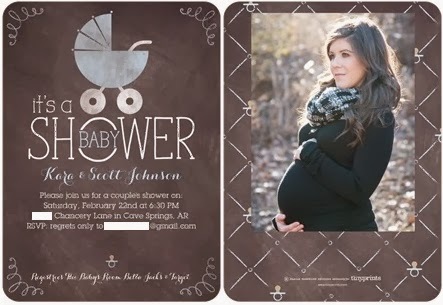 My sweet friends are throwing Scott and I a couples shower and I'm so excited about it! They sent out the most beautiful invitations and I literally got a tear in my eye when I saw it for the first time. It's going to be a great evening!